We wish all our readers a very happy and safe Diwali. May Goddess Lakshmi shower her blessings for prosperity, health and progress in life of each one of us. 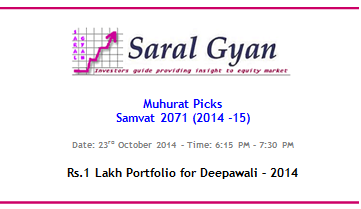 We are pleased to inform our readers that Saral Gyan Rs 1 Lakh "Muhurat" Portfolio - 2014 has been emailed on 22nd Oct'14 to all our Hidden Gems, Value Picks and Wealth-Builder members. The performance of the same will be reviewed a day before Diwali festival in 2015. We have also updated all our members on our Rs. 1 Lakh "Muhurat" portfolio recommended last year by our equity analysts. Like past years, this year also we have selected 10 scrips as “Muhurat Picks” that we believe should do well on the bourses in the next one year. Our stock selection is done with lot of research and data analysis. We first identified the sectors that are likely to do well in the next 12 months. Having that done, we further refined our search to select companies from those sector. We have created a portfolio worth Rs. 1 Lakh comprising 10 scrips so that it can help investors to create a model portfolio with lump sum investment upto 1 Lakh with time horizon of one year. We have given the different allocation to each of the scrips keeping in mind the risk versus returns ratio. We have also fine tuned the portfolio with large-cap, mid-cap and small cap scrips so that the investors can invest in a complete mix of stocks to balance their portfolio. In our model portfolio, we have included large caps along with some of our Hidden Gems and Value Picks recommended by our equity analysts team from small and mid cap space. The "muhurat" trading session will be conducted for 75 minutes (06:15 PM - 07:30 PM) today, October 23, on leading bourses NSE and BSE. The special trading session would be conducted to pay obeisance to Lakshmi, the Hindu goddess of wealth and prosperity. It would also mark the New Year for traders as per the Hindu calendar, or Samwat 2071. If you wish to receive Saral Gyan Rs. 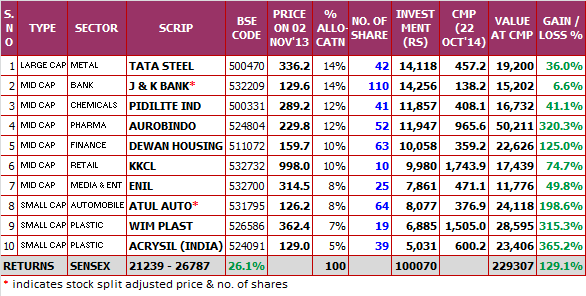 1 Lakh "Muhurat Portfolio - 2014 of 10 Stocks, Subscribe Now! Join us on auspicious day of Diwali, choose any of our annual subscription services / combo packs under our ongoing Dussehra - Diwali offer - 2014 and we will activate your subscription within 2 hours. We will ensure that you receive Saral Gyan Rs. 1 Lakh Diwali Muhurat Portfolio of 10 stocks before "Muhurat" trading session today. We are glad to share that Rs. 1 Lakh "Muhurat" Portfolio - 2013 outperformed major indices Sensex and Nifty during last one year. Saral Gyan Rs. 1 Lakh "Muhurat" Portfolio - 2013 has given absolute returns of 129.1% compared to Sensex returns of 26.1% and Nifty returns of 26.8%. Four stocks out of ten of our Diwali Muhurat Portfolio of last year have given returns in the range of 200% to 365%. Star performers of our portfolio were Acrysil (returns of 365%), Aurobindo Pharma (returns of 320%), Wim Plast (returns of 315%) and Atul Auto (returns of 199%) where as laggard was J & K Bank which has given marginal returns of 6.6%. We are glad to share that 22 Hidden Gems (Unexplored Multibagger Small Cap Stocks) out of 36 released by our equity analysts during last 4 years have given more than 100% returns. 9 Hidden Gems out of 22 have given returns in the range of 200% to 1000%. Value Pick (Mid Caps with Plenty of Upside Potential) stock like Amara Raja Batteries, Godrej Industries, Yes Bank, Aurobindo Pharma, Kewal Kiran Clothing, VST Tillers, Mindtree etc have given returns in the range of 100% to 600%. We also take this as an opportunity to thanks all our readers for their association with Saral Gyan and look forward to a rewarding and long lasting relationship.